You are amazing!! 800k to go to treat Joseph!! We did it! Actually YOU DID IT!!! There really aren’t words that can describe the past few weeks, but the best place to start would be gratitude. 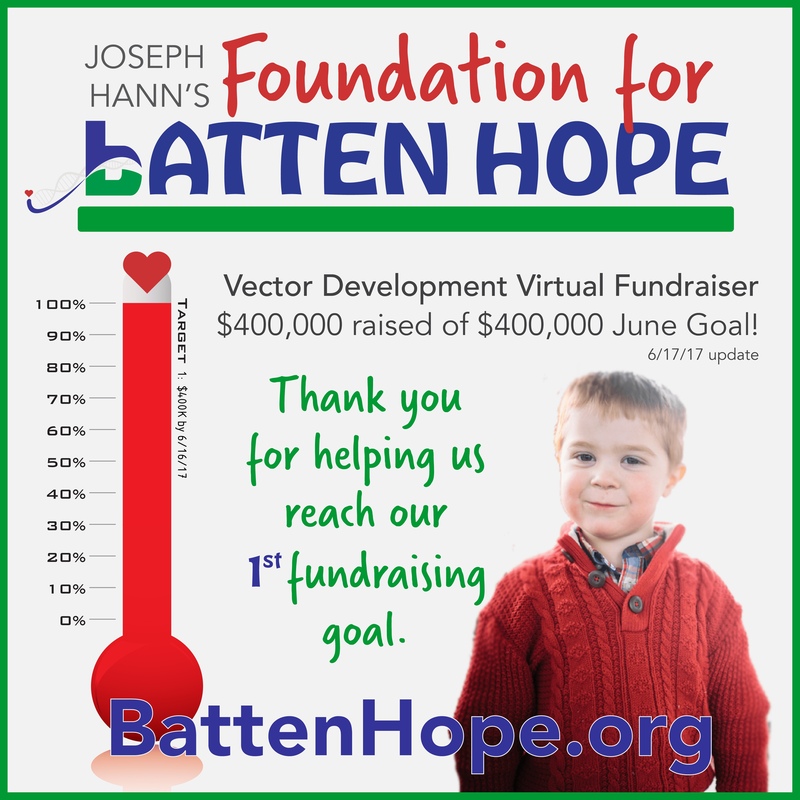 We had a big goal to hit the $400k needed to cover the initial payment in June on this road to realizing a trial for Joseph, and because of your generosity, partnership and faith we made it to that milestone. Every single donation helped, every single effort to share our story mattered. Thank you. Yes! Joseph will be part of a clinical trial at UTSW and Children’s hospital in Dallas. If successful the progression of his disease will stop. This potential has been demonstrated in other trials in the past. 2. What happens after gene therapy? Gene therapy buys us time to see the cure that many teams around the world are working to realize. Dr. Minassian at UTSW has been part of this process before for a disease called Lafora – and he is delivering a treatment to market for that disease in 2018. Because of this, and feedback from other families who have reached similar goals, we know that if treated through the gene therapy trial, Joseph has a chance at leading a great life. 3. Why do you have to pay for this? Joseph’s form of Batten is very rare and phase I trials do not get covered by insurance. Unless a larger population is affected, it is difficult to find sponsorship. We have to get the initial funding independently in order to realize this trial, but thanks to the partnership with UTSW and Children’s Health, we aren’t in this process alone. 4. What are the financial goals for this trial? We need to fund the vector development for this trial – this is roughly $1.2M, by fall of 2017. There are several milestones in the path to a clinical trial including the vector (dose), toxicology and the clinical trial itself. We are working with UTSW and Children’s to make the work done for Joseph’s trial benefit many children in the future. 5. Will others benefit from this trial? Yes. The outcome of this trial will help to establish a data set that could be used for other forms of Batten and to further research in other neurodegenerative diseases like Alzheimer’s, Parkinsons, and epilepsy. Cures for rare-disease are built upon data sourced through clinical trials like this one. UTSW and Children’s are working on a collaborative data model which will expedite the path to ending rare neurodegenerative diseases worldwide. We do have a long way to go, and our next goal is now $800k by fall of 2017 – with you on our team we will make this happen, and do our part to continue this work to end rare-disease. ← Joseph’s Journey: This brain-smart diet is good for your kid too!